Match colorful gems and keep the customers happy. 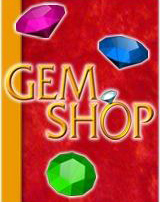 Sell gems and jewelry to smiling customers, but keep them waiting too long and they´ll storm out. You will need to give them a special treat to keep them happy and get the sale. Special tokens allow you to upgrade your shop with more jewelry and customer treats. Cons: u gotta work ur but off fast. Comments: I did not like the sliding part of the game and did not have enough bonuses.